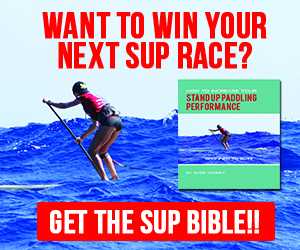 This is a special story written by a special client and friend who’s goal it was to paddle and train for the 8th Annual OluKai Ho’olaule’a SUP race here on Maui this past April. The race begins on Maui’s intense N. shore in the bay known as Maliko and exits immediately out into intimidating open ocean swell and continues all the way over and through surf to Kanaha Beach Park. 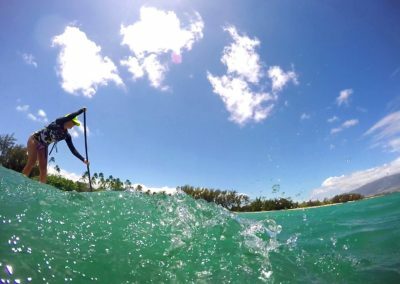 It is an amazing, fast action packed 8 mile, epic downwind, surfing and paddling sprint style of a race that draws paddlers from around the globe. It requires courage, bravery and trained strength and lots of ocean confidence. And now it’s time to introduce you to our paddler and tale teller, Alysha Sparkman who lives with her husband Sidney, in beautiful upcountry Kula. 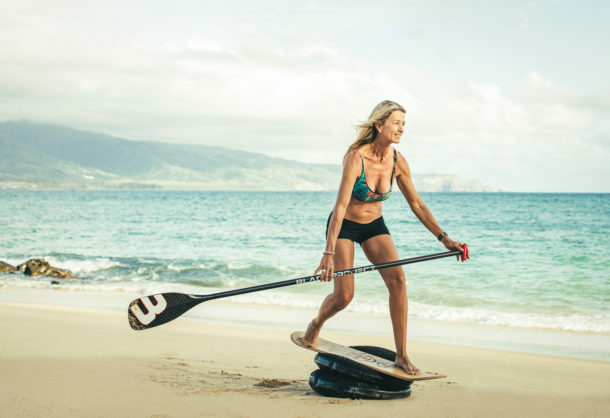 Alysha loves to surf, paddle, spend time with her family and is VERY strong. ( strong minded too! ) As you read about her journey you will smile and laugh out loud and feel inspired by her contagious way with words. You will feel like you are right there with her. 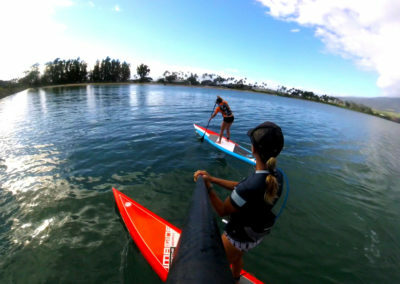 I have had the pleasure of training Alysha for some time as our early days of paddling and preparing for this big day began from small waves on the South side to countless laps in the harbor, mini downwinders and lots of land strength and balance training. I’m very very proud of her. Now let’s learn about this whale…. On Saturday, April 30, 2016 I set out to accomplish my New Year’s goal. 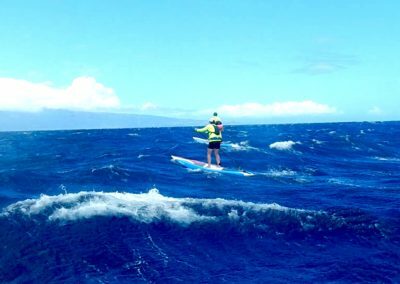 The goal was to simply complete the 8 mile down wind run for the Olukai Ho’olaule’a SUP competition, from Maliko Bay to Kanaha Beach Park. It really seemed like a reasonable goal as I’ve always been a water person. Since childhood I was on the swim team, water skied, snorkeled, scubaed, kayaked, toobed, and surfed. Pretty much any water recreation that was available I’d jump right in! To say the least, water is my happy place. My parents and husband have often wondered why I just wasn’t born as a fish! 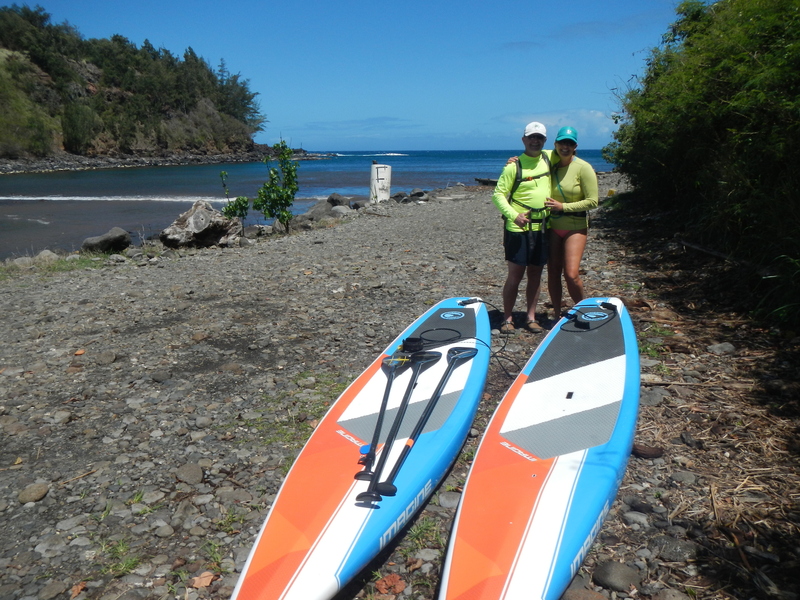 Leading up to the Olukai my husband and I practiced many long distance paddles to build up our endurance and hone our skills. 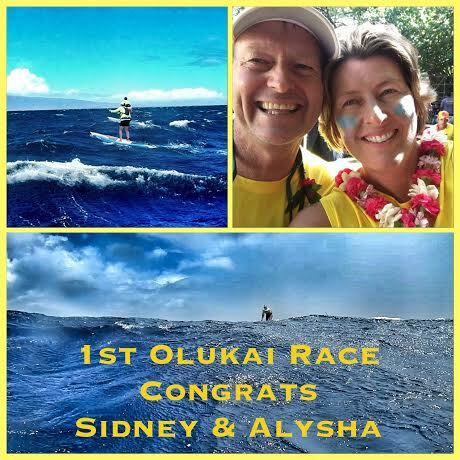 The longest one being 10.5 miles in Kihei a few weeks before the event. 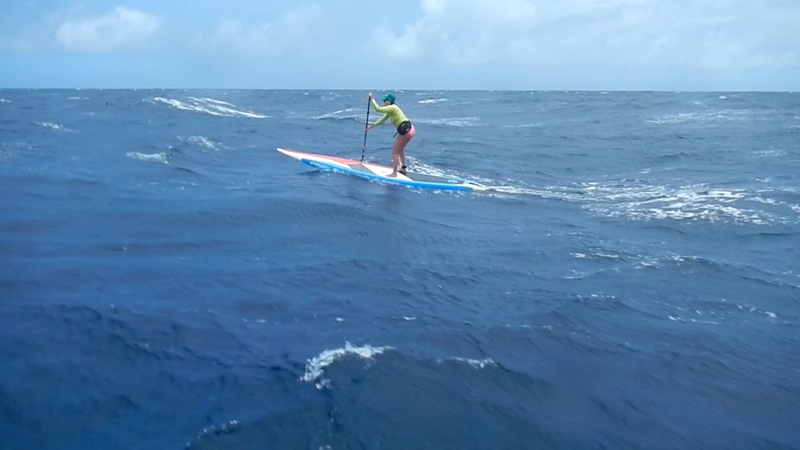 However, because weather conditions were not quite cooperating we were only able to make one Maliko downwind run with our trainer, Suzie Cooney, on the Wednesday prior to the race. 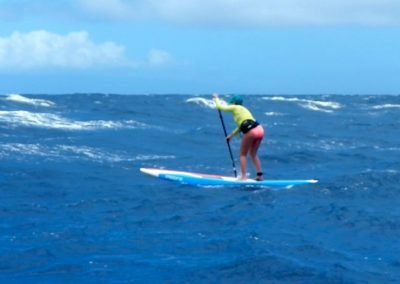 Even though we had been training and preparing for months we certainly felt the gravity of this 8mile paddle, on a 14foot board, in the open ocean, with galing winds and substantial swells. However, a goal is a goal, right? Of course it is, so went home, licked our wounds, rested and reared up for our big event on Saturday, April 30th. The day of the event my husband and I felt pretty good. We’d completed the course on Wednesday and just knew the second time around would be a walk in the park. With a twinkle in our eyes, a spring in our step and smiles on our faces we loaded up our boards and paddles and headed down to Kanaha to catch our shuttle to Maliko. Once on the shuttle we began to chat with others who were doing the run for the first time, as we had on Wednesday. 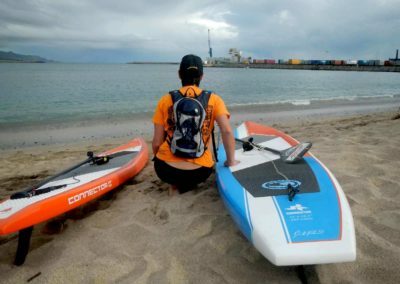 Paddlers from New Zealand, Australia, and all over the world. These lovely people and their genuine comradery also renewed my confidence and resolve to accomplish my goal. By the time we arrived to Maliko Bay I was Alysha Feel Good and super excited to set out and complete the 8 miles ahead. Just to reiterate, complete, not compete. With that said the time had come. Noon was here and over 300 paddlers launched their boards into the water making ready for the signal to begin! 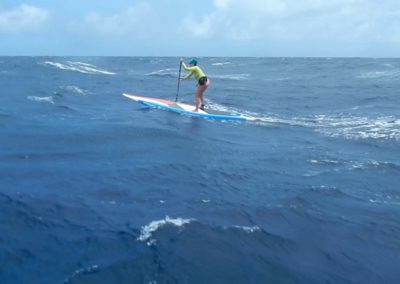 We were packed into the bay like sardines and when the flag finally waived I felt a surge of relief to begin my paddle and gain separation from the masses. 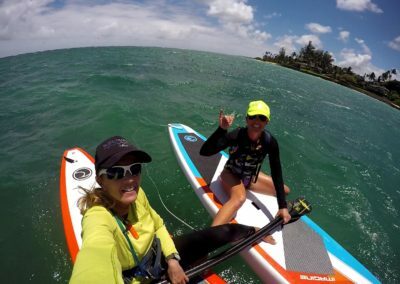 My division, the women’s recreational SUP, started out of the gate first. As we began I looked to my coach, Suzie, and decide I would just follow her. Well, that worked out for about 5 seconds before she vanished ahead and then I didn’t lay eyes on her again until I made it across the finish line 1HR and 35MIN later. Once Suzie disappeared I fell back onto her words of wisdom. Go out Alysha. Go past the reef, a good mile+ before you turn to head down the course with the wind at your back. Speaking of wind. The wind was gusting at approx. 30+ mph. The swells were bigger too, from waist high to over my head. Much more difficult than what I had endured Wednesday. Again, in my mind I heard Suzie telling me to go to my knees if the wind was too much to bear. 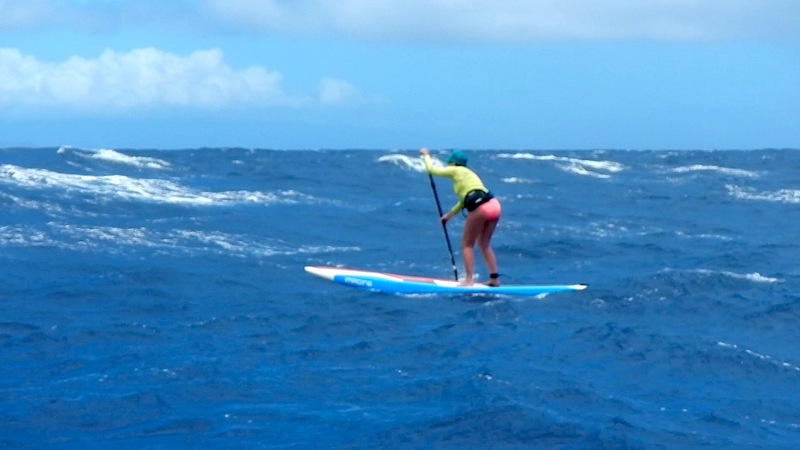 On my knees I went as I continued to paddle out into the deep blue. Once out far enough I finally jumped to my feet, and allowed my board to hang a left. Before I could say “go” wham, slam, off my board I went. Crawling back on, soaked to the bone I felt comforted seeing the helicopter above and several paddlers to my left and right. With fresh vigor I jumped to my feet again. Then slam, wham, off my board while inhaling a gallon or so of salt water. 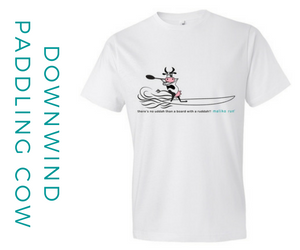 Of course the swells weren’t giving in, so again I crawled back onto my board, coughing, but knowing I had to get to my feet quickly. The succession of falls continued. I couldn’t get my feet beneath me and began to tire not even 2 miles into the course. I was seeing fewer paddlers and the ones I saw were over ½ a mile ahead or to my right or left. I no longer saw the helicopter or the safety jet skis. Suddenly I realized I was all alone. As most of us know alone is a tricky state of mind. Especially when you’re being challenged mentally and physically beyond anything you have ever experienced before. My mind is no exception and it began to take me down into the deep abyss as I began to recall several whale’s tales. 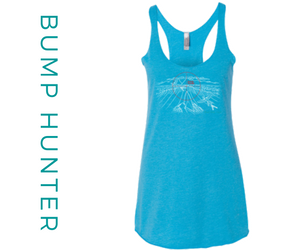 The Humpback Whales journey from Alaska to Hawaii each year to birth their calves and then mate. I’ve often heard stories of how predators trail these whale pods and wait for an opportunity to snack. Those dam, snacky sharks! One of the most aggressive shark species, tiger sharks, often prey on Humpback Whales, usually targeting the young calves or adults who are sick or in distress and falling behind. It was within these ominous thoughts it dawned on me….. I was the WEAK Whale! 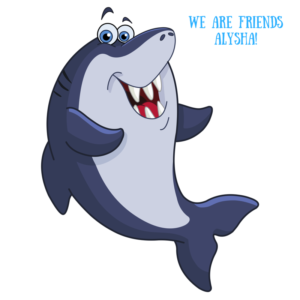 I had fallen behind and I was going to be a shark snack! Wow, I was really beginning to not feel well. Alone. Falling off my board being pounded by wind and waves. My body dangling into the water, I anticipated JAWS! It was during this “epiphany” that I decided it was necessary to have a chat with Jesus. During our discussion I assured him that should I make it to the end of this course alive I would do many wonderful things which I am now working on. My promises were limitless and as the conversation continued I realized I was actually staying on the board! Thank you God! His wind was at my back. He was helping me along! 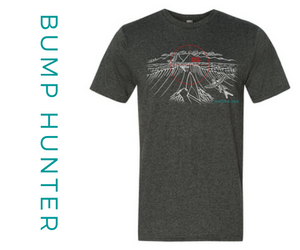 I began catching bumps and glides and feeling pretty darn good. However, I needed to continue to fill the space in my head so I started singing to self soothe. Those that know me know there is nothing soothing about my voice, but it worked anyway. 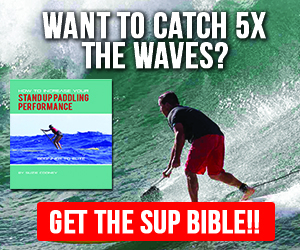 Jesus and I were riding some waves and escaping the big bad Tiger Sharks lying in wait for me as their morsel! I was no longer the WEAK Whale! Hallelujah! Finally, after an hour and a half I make the turn in to Kanaha. What a wonderful sight, that beach! The people! And I was even ahead of a few! It turns out I was 288 out of the 294 that actually completed the race. I guess I wasn’t the weakest whale, but I certainly have a lot more practice to do before next year! On that note I want to thank my coach, Suzie Cooney, for her guidance and support through my SUP journeys. If it wasn’t for you I wouldn’t have been able to do it! I also want to thank God for being by my side during the loneliest hour of my life and getting me to safety. And in a big, bad way I want to thank the Maui Tiger Sharks Possy that decided to let me go out of Maliko! Mahalo! Bravo Alysha. Your a no longer the weak whale as you felt that day. You are the water woman warrior I’ve always known you to be. 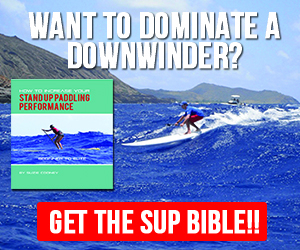 To conquer your fear of sharks ( which makes no sense since you love to surf ), to step onto the wild blue with 300 others, and to find a way to manage that fear and turn it into this inspiring, heartfelt story is amazing. Thank you so many times for showing up to the beach or the harbor with a smile on your face. Remember our first mini downwinder.. WOW..you took off like a rocket. It has been a wonderful journey to see you grow and thrive and gain great physical and mental strength. I will always see you as the water warrior. Remember to IMUA with great might and share your knowledge and experience with others so they too can now learn from you. I am really hoping that we get to see you and Sidney at next year’s 9th Annual Olukai Ho’olaule’a because with all that you are and all that you know, you will NOT be the weak whale. Please leave a comment for Alysha to enjoy and share this article with your friends to inspire and encourage them too! I love this story so much! You have never been the weak whale. Your family is so proud of you and this accomplishment. We love you!! Thank you my wonderful, beautiful and supportive sister in law. Love you too! Very up lifting story. Thank you for sharing your adventure. That’s a great story! Indeed, the mind is the greatest obstacle to overcome in any challenge, big or small. 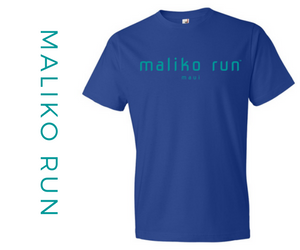 I do hope you feel now that you have done Maliko ‘alone’ that you can do it – alone. Not by yourself of course, with a buddy or two. But without a coach every time. Tips and pointers are great, but nothing beats getting out there and doing it! Aloha, and see you soon! What an awesome story of determination and adventure! I am very proud of you and your incredible accomplishment! I have battled with myself several times during long hard races but having the faith and mental strength is the key. A person who commits their self to a big challenge and completes it is always a winner in my book! I am keeping busy training on my new board and enjoying the summer break with my son. Looks like you are having fun also! Work has been getting busy but I will let my crew know you said hello. If you get a chance can you please email me a copy of the photo of you holding our photo. I tried to print it from your letter but it came out grainy and I want to print one for the station. I’d be happy to send.. Will send you via email.. Warm aloha and thank you for all you do to keep our sport so amazing. Totally stoked to have completed this goal. Thanks for your kind words. 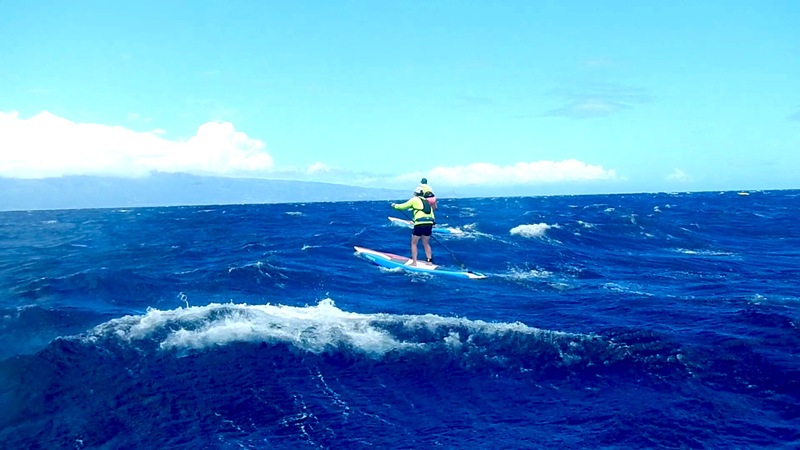 Now preparing for an OC6 paddle from Maui to Lanai in October w/ family and friends. Hope to meet you on the water.